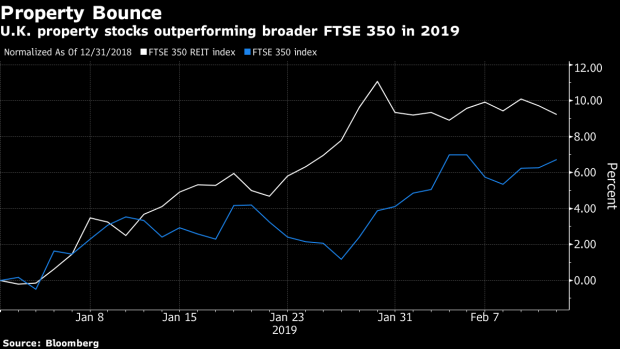 (Bloomberg) -- London’s office market could be headed for a fall whether the U.K. leaves the European Union with or without a deal, according to one broker that predicts a downturn. London office values have held near record highs since the Brexit vote thanks to a flood of overseas capital attracted by the weak pound and resilient demand for space that’s been boosted by the rapid growth of operators like WeWork Cos. Those pillars of support could easily crumble, the Berenberg analysts said, with overseas demand vulnerable to sterling appreciation, Brexit or political intervention and the risk that flexible office operators become distressed as rents begin to fall, putting more pressure on prices. The widening gap between rents for the best offices and older buildings means companies including Great Portland Estates Plc and Derwent London Plc that have large numbers of properties for future redevelopment could be exposed, the analysts said. The sector is “walking a tightrope” and while the quality of assets held by the firms has improved and companies have done well to deleverage, a cyclical market correction would impact listed London office companies “meaningfully,” they said. RBC Capital Markets analyst Julian Livingston-Booth agrees that the sector looks unattractive with rents near highs and property yields near lows. While commercial real estate markets in the U.K. have become less cyclical, they “have not lost their cyclicality,” he wrote in a note on Monday.